Hrm, some recent developments might require that I curtail the posting frequency. Not sure. We’ll see how it goes in the next few weeks. A few folks have inquired about the lunch I had in this entry, so I figured I should write it up seeing as it is a great dish in cold weather months. We’ll start with one of my standards: soy sauce chicken. It’s just chicken drumsticks simmered for a few hours, but what you get is chicken and a lovely aromatic broth. I like using organic chicken. 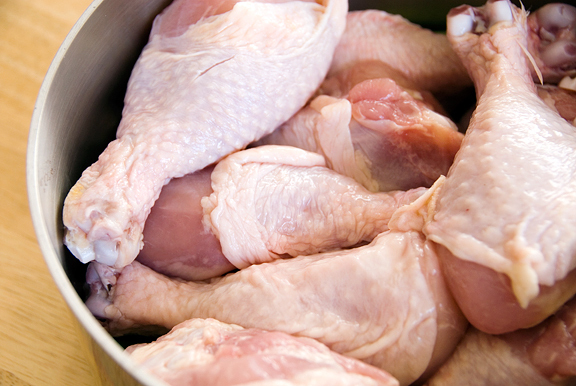 If you’ve ever made broth from organic chicken and from conventional chicken, the fats are completely different. When I refrigerate the broth to remove the fat, the conventional chicken is practically a yellow disc of fat whereas the organic chicken renders an almost colorless and slightly liquid fat. The star anise adds a nice accent to the soy sauce base. Simmer for a couple of hours or until the chicken is falling off the bone. 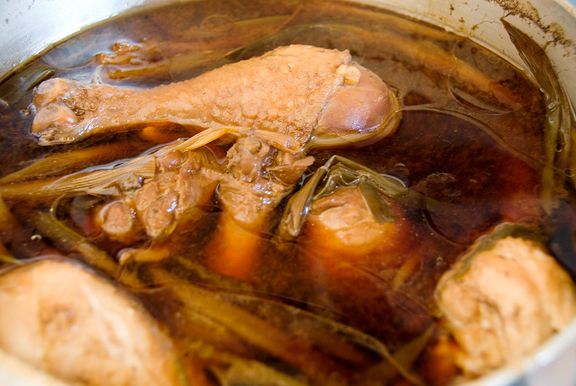 Usually, after the chicken is cooked, I remove the drumsticks from the broth and chuck the skins and bone. I store the chicken meat in a tupperware. The broth is poured into a bowl or tupperware and refrigerated for defatting. Now on to noodles. 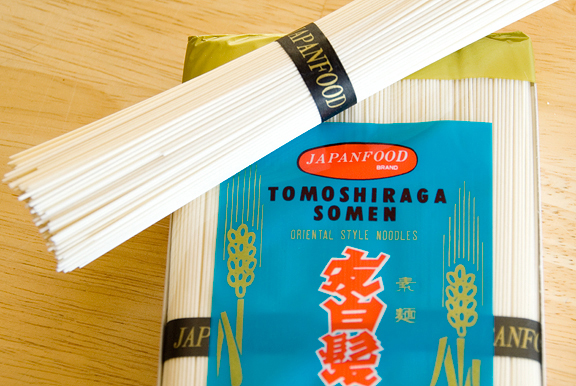 My favorite noodles (almost a comfort food, really) are Japanese somen noodles. 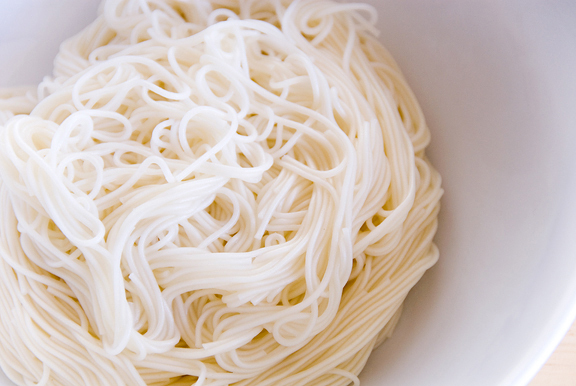 My grandmother used to make these noodles for me when I was a little girl. They cook in no time flat, so be sure they don’t turn too soggy (like a couple of minutes). I prefer to boil them in water rather than the broth because the noodles tend to make the broth starchy and the whole thing is just too salty. Once the noodles are cooked, drain them and place in a bowl. In the same pot I just used, I’ll heat up some of the broth with a little water (it’s somewhat concentrated broth). 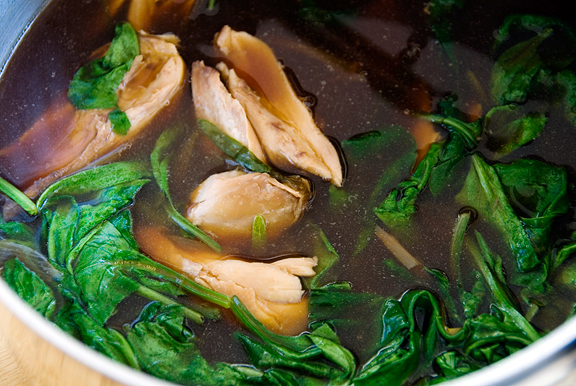 When it comes to a boil I chuck in pieces of the chicken along with greens – my favorite being spinach. Pour the contents over the noodles. If I’m feeling decadent, I’ll add a poached egg (runnnnnny) and I always top the whole thing off with some spicy chili radishes. That bowl will take your energy into the wee hours, really. Place all ingredients in a pan with a tight lid (or use a crockpot). Bring to boil and then reduce to a simmer so that when you cover the pot, the liquid will not boil over. Simmer for 2 hours. 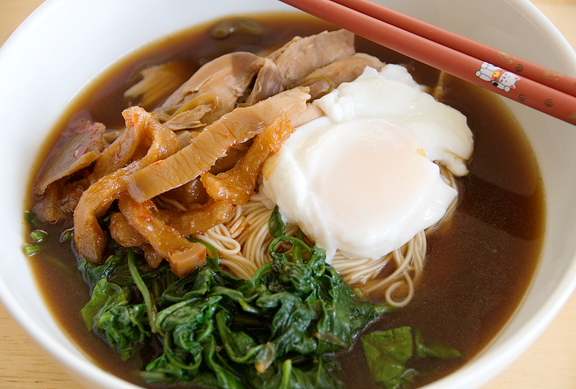 I like to remove the bone and skin from the chicken and serve the meat with the broth over Chinese noodles with bok choy, napa cabbage, or spinach for a Chinese noodle soup. That looks great for cold weather. I think this will be dinner tonight. Thank you. Jenn, what camera do you use. I am trying to decide which camera I want to put on my christmas wish list (doesn’t mean I’ll get it, but my pics are hopeless and yours are gorgeous. ) I have a sneaking suspicion that it’s not the camera that’s at fault, but I am a crappy enough photographer to need all the help I can get. I love the colours! I can tell this must be delicious, because the colours are so deep and rich. This looks sooooo good. I am going to have to try it this week! I love your photography – it’s so clear and simple and stunning. Not to mention I’m supremely jealous of that gorgeous bank of windows I saw in your last post! *sigh* I’m taking pictures in a tiny apartment that gets good light for about 2 hours each day. Love coming here and being inspired by your photos! That sounds wonderful, including the egg on top. It may well get on next weeks menu to try. This looks and sounds really good. I’ve never tried this noodle soup. It sounds so wonderful. There just aren’t enough days for me to try all your recipes, Jen! 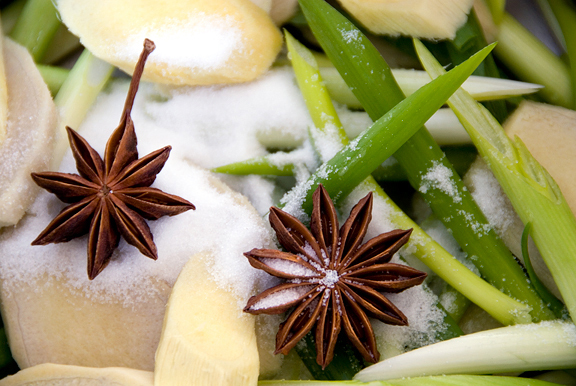 Ma-li – isn’t it funny how a bowl of this stuff makes you hungry? Peabody – great for cold weather and incredibly comforting when sick! AV – I hope you like it! I’ll send you an email about cameras. hannehanne – I think it is especially good when served piping hot. beruta – you said it. katie – great, i hope it works out for you. Anita – you’re too sweet. Your photos are great too. The lack of daylight hours is putting a cramp in my style though. I may have to resort to flash before you know it! Esther – yeah, that egg does it for me ;) I just love a runny yolk. My husband is afraid of them (runny yolks) hee hee. HB – Ah, you’re kidding me? You’re like my sister in Asian food! How can you not have had this before? Okay, to be fair, I don’t make pho as often as I’d like. But now that I can snarf recipes from your blog, I know they’ll be authentic and delicious. I saw your savory bowl of soup and i knew i had to make it …i follwed your recipe but with out the aniseand i tweeked it a bit by adding garlic instead of anise…i made the stock yesterday so im planning to make the somen inspired noodles today for dinner…its perfect becasue its gloomy and rainy in boston! Exactly what I was craving for dinner tonight and still crave by the way, so this shall be dinner saturday night! Butternut – I hope it came out wonderfully. I am not a fan of licorice… anise. But believe it or not, this actually adds a nice accent that I never would have guessed. It’s fine without, but it is also lovely with. Yowza! This looks amazing! I can’t wait to try it. Thanks! I made this last night and it came out very good. This morning, the left over broth was very concentrated and I was surprised at the low level of fat left over from the organic chicken. Good choice. I think the noodles cooled the broth down too much, as I rinsed them with cold water, so I’ll try and pick up a bigger soup bowl today. Thanks! I made this yesterday and it went down very well with everyone including the small one who had lots of fun eating the noodles :) We had eggs which it was agreed worked well but they would also have been happy without it without them as they liked it so much. I have enough left for my lunch in a minute which is even better. Definetly one to add to the regular recipe list. Traca – it’s pretty easy and really tasty. Jay – Great! So glad you liked it. Very versatile recipe too. Katie – ha ha! That’s a great image of a cat pacing ;) I’m so happy you like it. It’s one of my comfort foods! Love your narrative and recipe. Crockpot worked like a charm. I put everything in it, left it on high for a couple hours, came home to some wonderful chicken. I boiled some eggs and left them in the crockpot (on low) overnight. I added a little shaoxing rice wine too. Great recipe! I made this dish two weeks ago for dinner and was really surprised at how flavourful the soup was, considering how simple the ingredients were. We both loved it.. thank you. You just fixed a very bad no good day with this soup. I made the broth last night and came home after a long, unproductive, and incredibly frustrating day attempting and failing to get some research done. I had the soup and suddenly the world is right again. I cooked this soup today, following your recipe, and lost my mind! It is so absolutely good I don’t know where to start! I discovered your site last year. Everything about it is wonderful! The pics, the recipes, the texts! Thanks for making the day of food-loving people! EA from Argentina. I was wondering where you get your spicy chili radishes from? I would love to make this, and the addition of spicy chili radishes sounds amazing! Stacey – you can find those in any Asian grocery store.